Our most important takeaways gathered from nearly a decade of content creation and publishing. It’s not news but it certainly stands true: Content marketing is at the forefront of marketing for small businesses. It’s a necessity in today’s crowded marketplace and helps your brand stand out from the rest. Back in 2008 it was still a relatively unknown commodity. Oh, how the times have changed. Since then, we’ve learned so much about content marketing. We’ve seen it rise from a seemingly risky, money-guzzling marketing strategy (theory might even be a more accurate description given how unproven it was at the time) to one of the most effective ways to market a business today. The last eight years have been trial and error through which we’ve gained a firm understanding of content marketing. We’ve been able to determine which of our campaigns are worth repeating and which are money pits. We’ve deduced which content is most engaging and what puts people to sleep. Of course one can’t go through almost a decade of blogging without picking up an assortment of highly-effective strategies, in-depth tactics, and useful tips. That said, it hasn’t been a cakewalk. We’ve had our share of failures, but it’s through those first-hand failures that we’ve come so far. We’ve done it all – we know what works and what doesn’t. First and foremost: quality ALWAYS trumps quantity. Publishing a bunch of 200+ word articles in hopes of ranking highly on Google doesn’t work anymore. Long gone are the days of short-form, keyword-packed content. The search engines saw how people were spamming their way to the top of the SEO rankings and have adapted their algorithms to prioritize quality over quantity. Make stuff that people will want to consume. You need to be creating content for the people who are consuming it: your audience. Otherwise, what’s the point? If people aren’t legitimately excited to read the content you produce, then you’ll have a hard time finding success in marketing it. Your content needs to answer common questions, present new ideas, offer solutions to your readers’ problems and most of all: provide value. What’s the best way to do that? Create long-form, highly-engaging content of the utmost quality – it needs to be superlative. In simplest terms, your content should be (or at least aim to be) 10 times better than any other piece of content for a given topic. Creating engaging (and free) high-quality content is massively important in order to stand out in a highly competitive marketplace. Since the start of 2016, we’ve released six gigantic pieces of content — with fantastic results! We’re starting to fly up the Google search rankings and have seen a huge increase in social shares, inbound links, and leads. Our pages have also experienced great user engagement signals including time on page, bounce rates and scroll rates, which Google takes into serious consideration when determining rankings for keywords. Good user signals also act as content validation: If people are spending over x minutes on your pages, it shows that they are actually consuming the content, not just leaving after a few seconds or skimming the page. This proves your content is valuable and worth reading. One last thing: aim well beyond your perceived content limitations. We never imagined that our Blueprints would be as awesome as they are, but because we aimed high, we inevitably got there. Shoot for the moon and you might be surprised where you land. Sometimes it’s not all about the content but more about how the content is presented. The way a reader experiences and engages with your content is just as important as the content itself. Last year, we gave our blog an extreme makeover, transforming it from a plain, unremarkable site to an online magazine with a beautiful, engaging interface. Along the way there were plenty of WordPress missteps, what seemed like a million design tweaks, and the task of re-optimizing over 70 articles, but we created a product we’re incredibly proud of — one that’s drawn praise from our loyal readers. Best of all, almost immediately following our 2015 blog makeover, we got more leads and increased organic traffic! Since then, we’ve seen a sustainable increase in organic blog traffic: about a 22% growth rate per month! 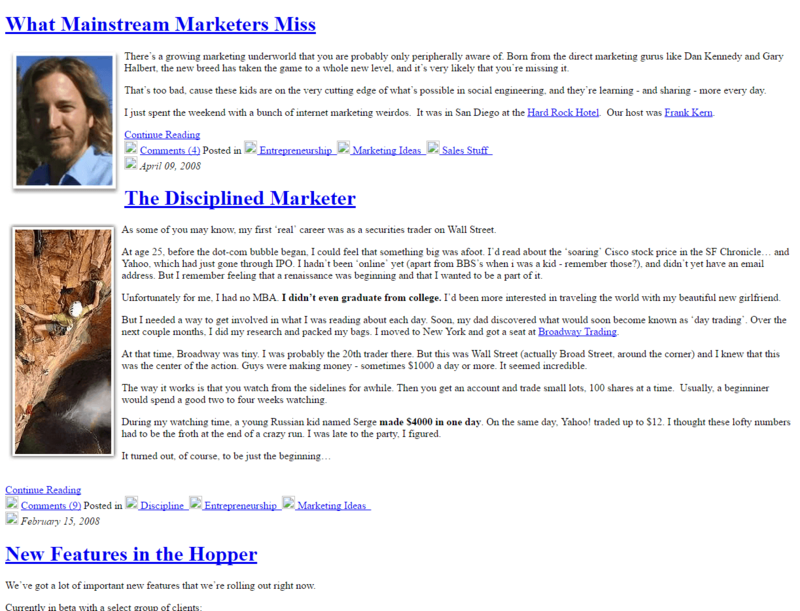 By no means are we saying that our blog is a poster child for blogs everywhere. In fact, it’s far from it – we are actually in the process of updating our blog yet again to keep it fresh, but our successes show that design, layout and UX matter. User experience is incredibly important in the content marketing world because of its ability to keep readers on your site. A page lacking innovative design and engaging copy repels readers. 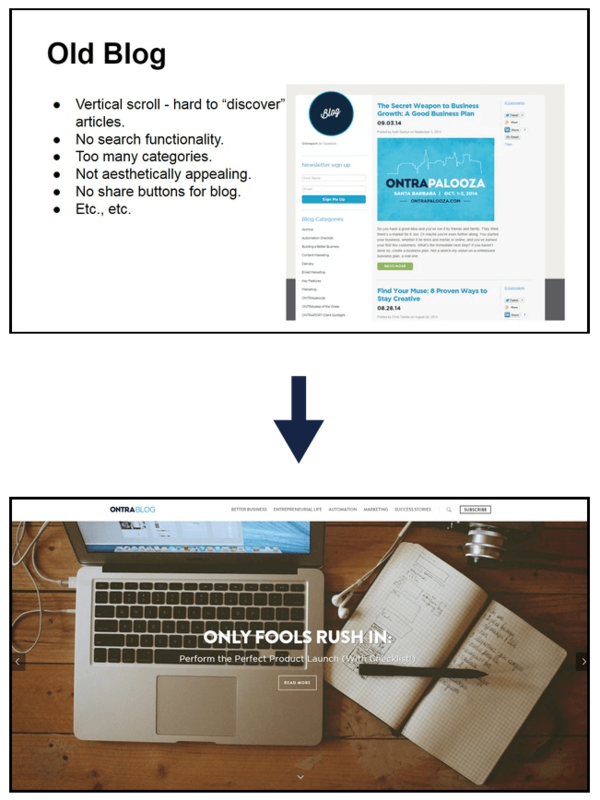 On the flipside, sending traffic to an engaging piece of content with incredible UX (like this, this, and this) almost guarantees that your audience will naturally stay on the page longer, giving you more time and chances to convert those visitors. One last thing our graphic designers are physically forcing me to include: In content marketing, remember form follows function. Create your content first and then decide which content medium will best present your content. This one is a huge must. SEO is no longer a “good thing to have” on your website – it’s absolutely vital to include in your content marketing efforts now. Why? Because almost nobody clicks past the first few pages of search results in Google. If you’re going to be producing content, go the extra mile and spend the relatively minuscule amount of time it takes to make sure everything is search engine optimized. It’s a total low-risk, high-reward situation and you’ll see amazing results. For example, we never would have seen great results with our Blueprints if we hadn’t prioritized SEO when we created our content. While it did take a decent amount of time and technical prowess, it payed off completely! The better your SEO, the higher you appear in search rankings. The higher you show up in search rankings, the more visits you generate to your site. The more visits you generate to your site, the better your chances of converting visitors. We now rank on the first page of Google’s search results for some really valuable keywords and we are seeing increased organic traffic coming in through those search results pages. Best of all: That traffic is free – we didn’t have to pay for it. Just think about how much of a difference an increase in free traffic, whether it’s small or large, could do for your business. Write rich, meaningful meta descriptions. Mark up your pages with structured data. Create an internal linking plan. SEO is something you simply can’t afford to ignore any longer. You’ll be happy you didn’t. When content isn’t being used to its full potential, poor strategy is usually to blame. Don’t waste your team’s efforts and your business’s resources. Before you create content, determine who you’re creating it for, when it needs to be published, how you’re going to promote it, and how you’re going to measure success. An organized content strategy answers all those questions and provides direction for all of your content marketing efforts. 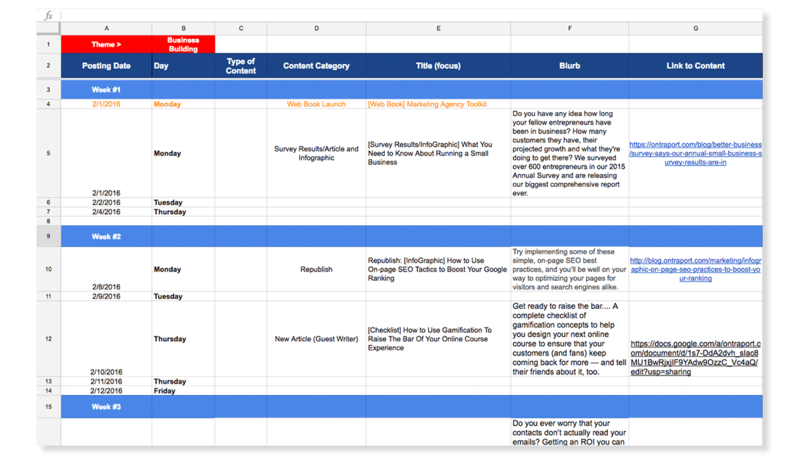 At the base of every great content strategy is a detailed content publishing calendar. It’s one of the most valuable documents on any content marketing team and helps you plan and visualize the types of content you are going to publish, where you’re going to publish, and when you’re going to publish. Scheduling, producing, and publishing content all revolve around it. For us, Facebook Ads are our bread and butter – it’s where we’ve found most of our success in content marketing. Why have they worked so well for us? You can reach a much larger and more diverse audience. There’s potential for a sudden explosion of traffic (if you get your ads right). Results can be measured and optimized on a daily basis – where other ad platforms (like Adwords) may be more long-term oriented. You can see an immediate return on the money you invest in ads. So what have we learned about Facebook Ads? Cost per acquisition (CPA) campaigns work better than cost per click (CPC) or cost per impressions (CPM) campaigns, in terms of opt-ins at least. The automated bidding system is much more effective than we could have ever hoped – use it and don’t waste your time manually bidding. Although the average click-thru rates are good, we’ve had very little success with the Facebook’s Audience Network, in terms of conversions at least. That’s not to say you won’t see great results, but that’s just what we’ve noticed. Ads placed in the right-hand column have been our lowest performers and are nowhere nearly as effective as ad placed in the news feed. Again, that’s not to say you can’t find success with those ads. We’ve found incredible success with retargeting ads (which we’ll likely write a giant post about because they are so awesome). Just know that they work really well. Be ready to adapt, and be resilient. Just because one thing works right now, doesn’t mean it will in six months (or even less), so be ready to change everything at the drop of a hat – such is business (and life itself). Stay alert and reactive, and you’ll thrive. Content Specialist Andy Reese graduated from the University of California, Santa Barbara in 2014 with a B.A. in Environmental Studies (emphases in Sustainability and Entrepreneurship). In his short career, Andy has already written grants and media plans for several businesses and nonprofits, worked at two tech startups and the Surfrider Foundation.